Missionaries of The Church of Jesus Christ of Latter-day Saints (LDS Church)—widely known as Mormon missionaries—are volunteer representatives of the LDS Church who engage variously in proselytizing, church service, humanitarian aid, and community service. 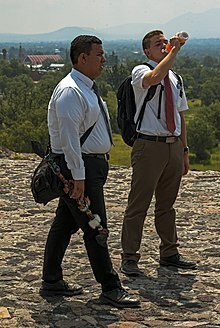 Mormon missionaries may serve on a full- or part-time basis, depending on the assignment, and are organized geographically into missions. The mission assignment could be to any one of the 407 missions organized worldwide.